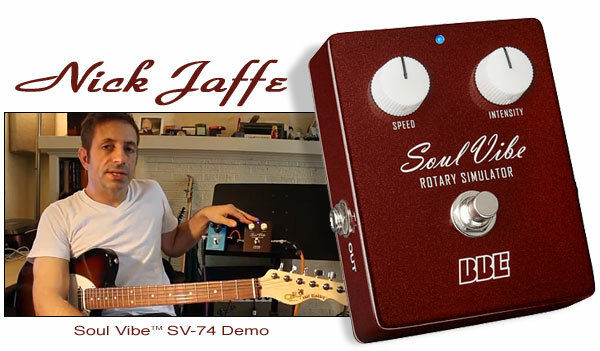 YouTube master Nick Jaffe has posted a cool new video demonstration of the BBE Soul Vibe™ rotary simulator. Nick covers all the bases from clean to distorted sounds, courtesy of his G&L ASAT® Classic 'S' Alnico and BBE 427™ distortion pedal, and lets you experience Soul Vibe first hand! Watch the video below and find out why Guitar World gave the BBE Soul Vibe™ their Platinum Award for quality & design. "This particular voicing on the Soul Vibe, it is a gift to live players because you can step on it with confidence regardless of what kind of distortion or fuzz or lead channel you're using. I don't know what else to say, you know? You can't go wrong with it. It's got two knobs and it sounds good in all positions." - Nick Jaffe. BBE Soul Vibe™: Countless guitarists claim that the Soul Vibe is the most convincing of analog rotary simulators, delivering on that Leslie experience complete with slight pitch changes as the horn comes and goes. Now Soul Vibe looks as sweet as it sounds. Check out that delicious root beer metallic finish, inspired by the warm, wood finished cabinet of a Leslie. Creme brownface amp knobs are the perfect complement, adding to the visual warmth, while the matching creme logo script puts this gorgeous new Soul Vibe in a class all its own.What hasn't changed is the Soul Vibe's commitment to an authentic rotary experience with the convenience, reliability and durability you've come to expect from BBE, including 1% metal-film resistors and true hardwire bypass. If rotary is your vibe, get a Soul Vibe and discover that heaven is still in heavy rotation. For more information about the BBE Soul Vibe™, click here.